Single-layer Sakura Bloom ring sling in gorgeous linen fabrics. Great for new babywearers and for hot weather wearing! Colors marked "Classic" are the original Sakura Bloom Classic. Colors marked "Basics" are the prewashed Basics line. Single-layer ring sling in gorgeous linen fabrics. Great for new babywearers and for hot weather wearing! Naturally antibacterial, cool to wear, and perfect for all climates, linen is also easy to care for and becomes softer and stronger over time. Colors marked “Classic” are the original Sakura Bloom Classic. Colors marked “Basics” are the prewashed Basics line. Standard (size 3) slings are 74-75″ in length and approx 26-27″ wide. Size 4 slings are 80″ in length and approx 26-27″ wide. Size 5 slings are 85″ in length and approx 26-27″ wide. 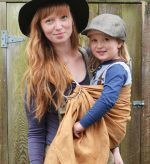 Why did I wait until my third baby to buy a quality sling? Don't be like me. There really is a huge difference between brands and materials, and Sakura is one of the best. Carry Me Away made the buying process easy (and fun--who doesnt l...ike happy mail?). 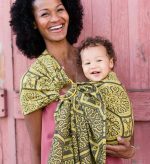 All of the information you nees to wear your baby well is included with your purchase, not to mention an amazing support system should you have any trouble. The baby has not arrived yet so I haven't used the sling for its intended purpose but it is beautiful and my cat falls asleep in it. Super fast shipment and great customer service!! This is my first ring sling, but I am loving it so far! I watched a few videos to figure out what I was doing, but it's not too complicated once you give it a try. It is a great looking sling, and it is great for a quick up. The sling shi...pped very quickly, and Laurel was quick to respond when I noticed that I had mistakenly entered my street address numbers incorrectly and was able to correct the issue prior to shipping. Shipping was super fast and I love the color. As soon as I put my son in it he fell asleep. I was a little surprised actually because the material seems a little rough. I'm having some issues with tightening and getting a good seat but it t...akes time to get a good fit so I just have to keep working on it. I'm hoping if I wash it a couple of times it will soften up and be a little more cozy. But I do like it very much. Hi Kayleigh, the Classic Linen carriers can seem a bit stiff at first, but they definitely soften up with washing and use. I highly recommend steam ironing them a few times also. Please email me at laurel@carrymeaway.com if you are still h...aving issues with getting a good seat! Amazingly fast shipping! Carrier was all that I was hoping it to be! I got the raven sakura bloom in a size 4! It is the perfect black ring sling with gold rings! The fabric is softer right out of the box than other linen ring slings I own. I like the gathered shoulder, it's the most comfortable for me. I lo...ve that they tag on the tail is the same on both sides! I know that seems weird to say, but I like that I don't have to wear it "inside out" to show the brand. Carry Me Away shipped the ring sling right away and were super friendly too! 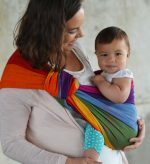 I would definitely recommend them to my babywearing friends!